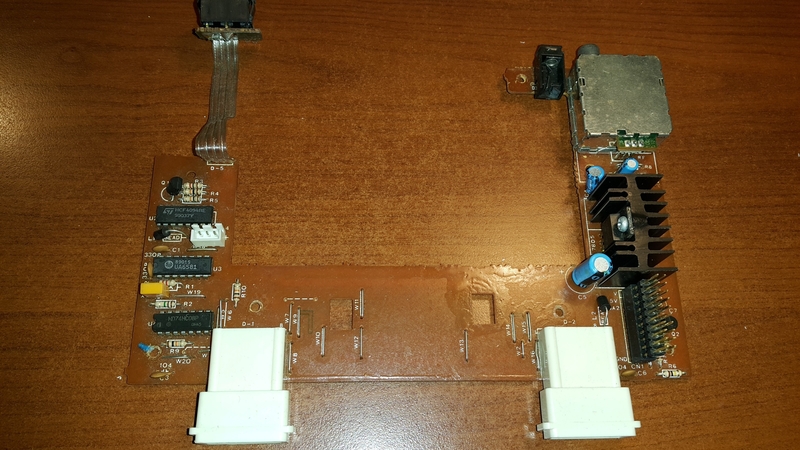 The mainboard contains just ordinary set of chips (UA6527+UA6538+2x74368 + 74373 + 74139). 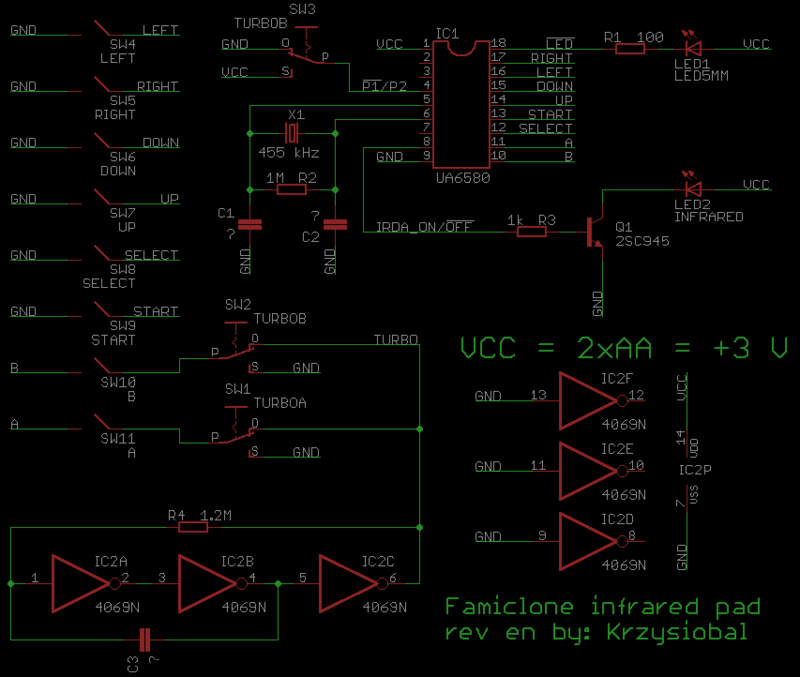 But when assuming that: 1=GND, 2=DATA, 12=STROBE, 14=CLK, 15=+5V) then this custom pinout might agree that 1=PAD1, 2=PAD2. 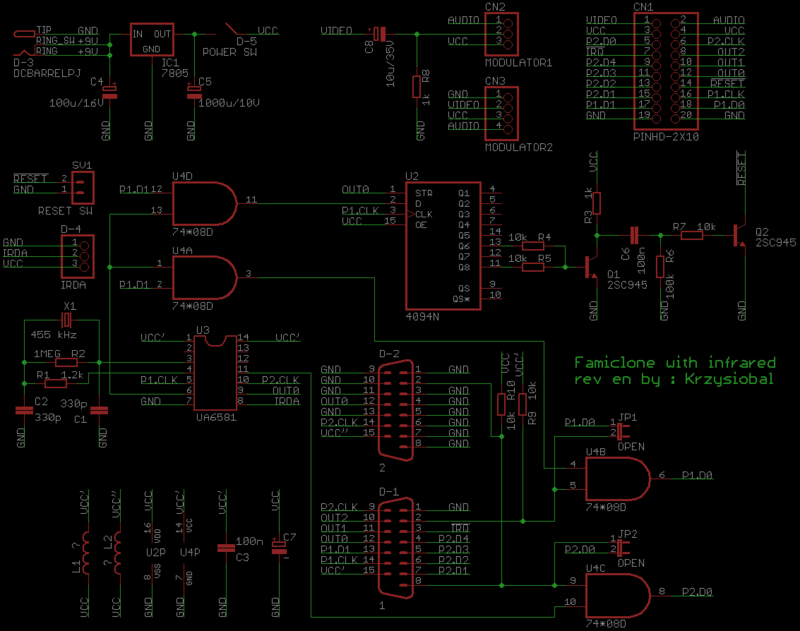 There are two jumper-wires (not soldered) which probably should be soldered when no irda & extra chips were soldered in. What's the IRDA protocol & how UM6581 works is still not known. 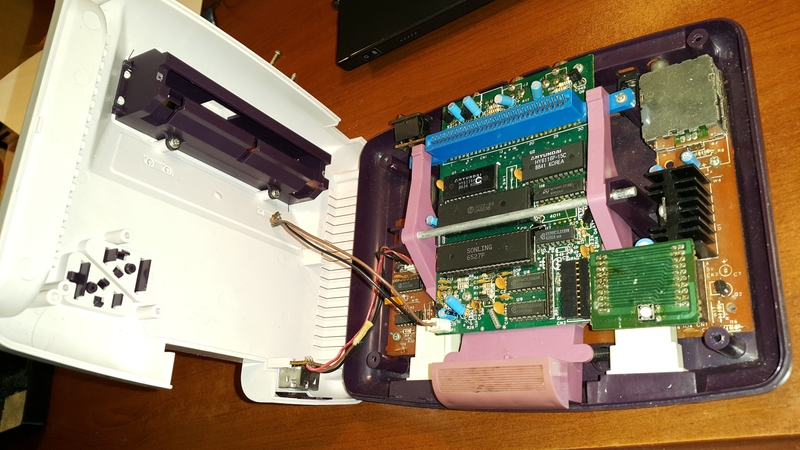 Some other famiclone's pads (IQ502) were equipped with UM6582. 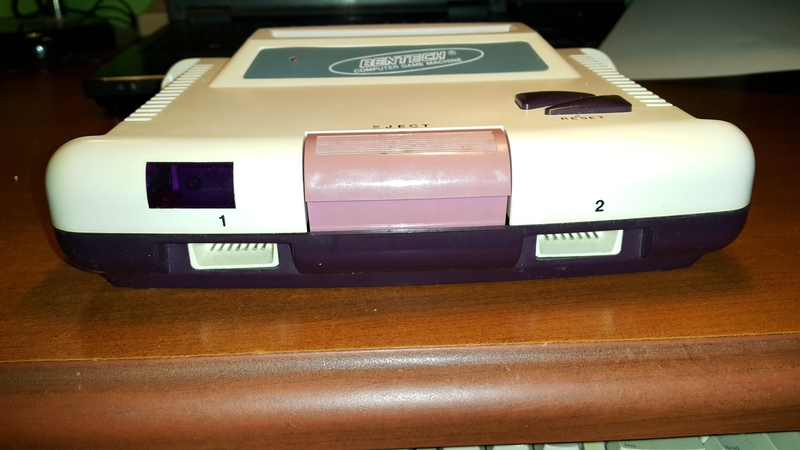 Also, 4094 can reset console (and it does it quite often as sometimes this famiclone spuriously resets). delay? |02 13|->P2 inactivity pulse? XTAL1 & XTAL2 are ceramic oscillator inputs (455 kHz). The chip has built-in clock generator (probably with inverter). 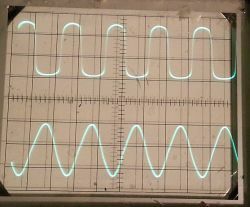 During operation, there is sine wave at XTAL1 and TTL square wave at XTAL2. This clock is used by chip to decode signal from IRDA input & measure idle time time. 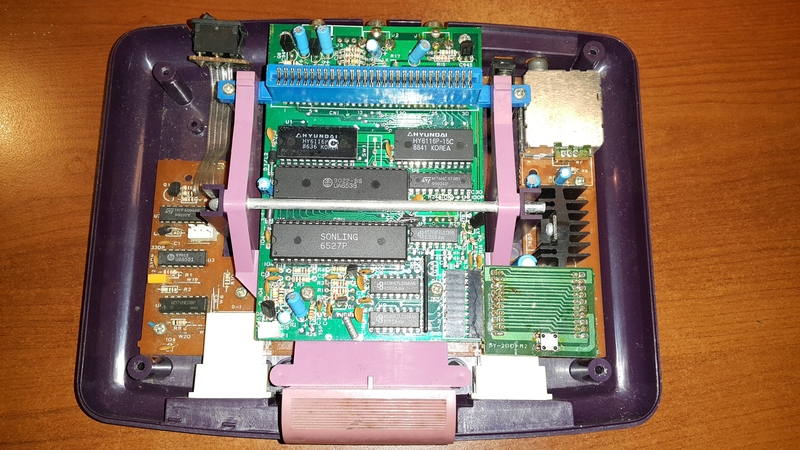 This chip has two 8 bit registers to store states of eight buttons for each player. 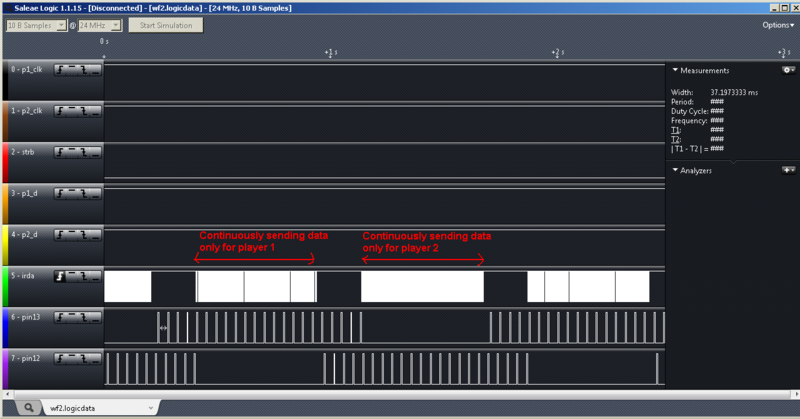 When it detects proper waveform on IRDA input, it updates internal register with received button states. 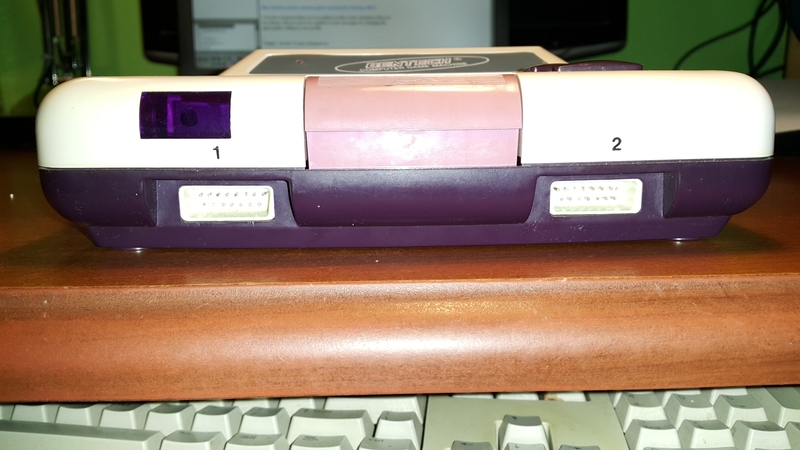 If no infrared signal is received within 25 ms for each player, internal button states for this player will be reset (set to ones). Original infrared joypads probably send those signals only if any buttons are pressed, instead of continuous transmission, to save battery. If signals from two joypads are send at the same time, they will interfere and no valid data is received by the chip, so probably they send the data more often that once per frame (25 ms) or in diffrent intervals. * after eight edges, D0 is driven with 0. 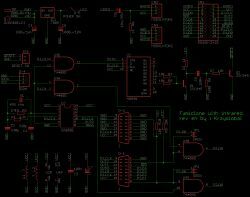 * Pin 1 & pin 2 have internal pull-ups to VCC and they acts as some kind of inputs, while pin 13 & pin 14 are outputs. * Pin 1 is probably !RESET. If GND is applied, chip does not generate signals on pin 12/13, ignores IRDA input,returns 0xFF for pad1/pad2 and if there were time shift between pulses on pin 13 and pin 12, they will be in sync after releasing reset. If data for pads are received, there won't be any pulses. 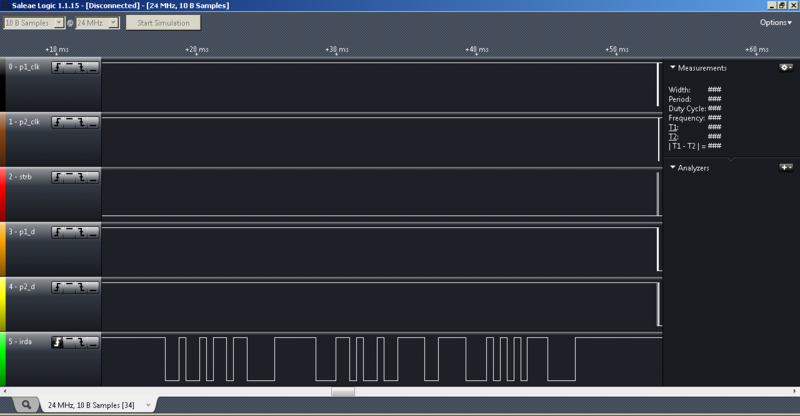 Maybe this signal can be used as some kind of notification for the pad to send signal. 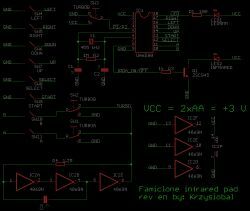 * Pin 2 selects fpoll (the maximum delay between receiving two signals for one pad which will not cause reseting button states. It is NOT analog input. 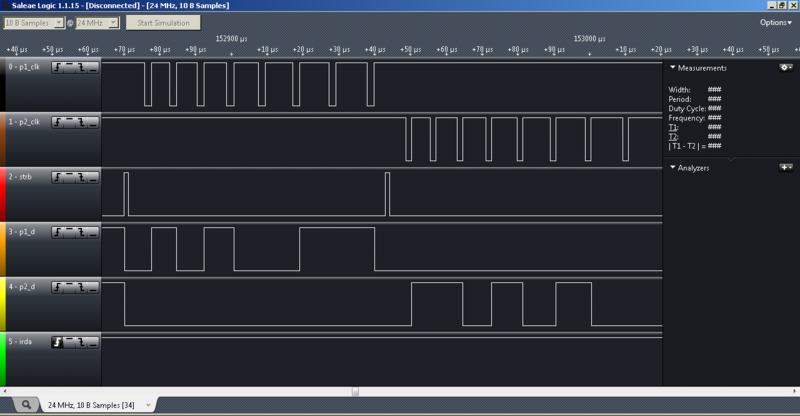 Some kind of frequency signal could be put here, but it should be in phase with pin12/pin13. 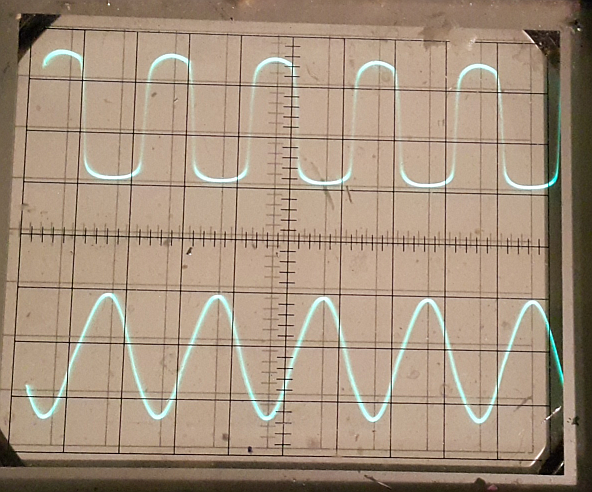 In my experience, infrared demodulator chips don't usually use a high-quality time source like the 455kHz resonator, instead just setting the demodulation frequency via an RC or LC. Actual IrDA doesn't use 38kHz modulation, in order to support higher bandwidths. The UA6581 chip is used to decode the remote controller infrared signal and in the remote controller is UA6580 to encode and transmit signal.This remote controller can switch 1P/2P and when you press SELECT + A button ，the console will reset.Both of the chip are created and manufactured by UMC(联华半导体公司） corp.
Last edited by 69yuan on Wed Feb 20, 2019 7:32 pm, edited 1 time in total. Thank you! 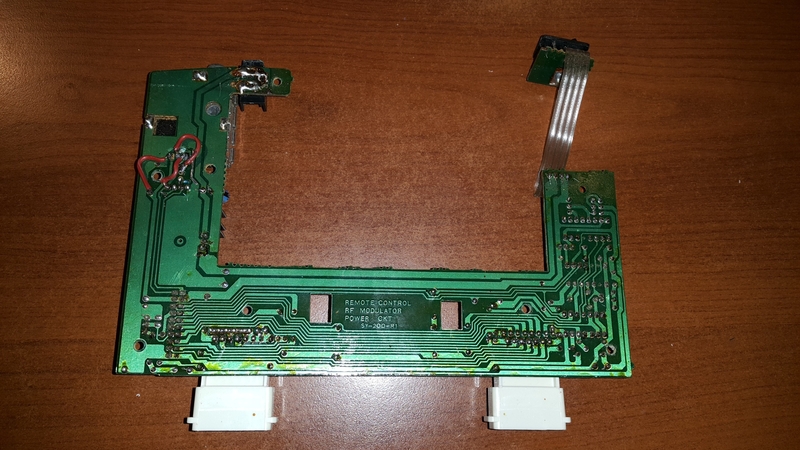 Can I ask for photo of gamepad's PCB from top side? 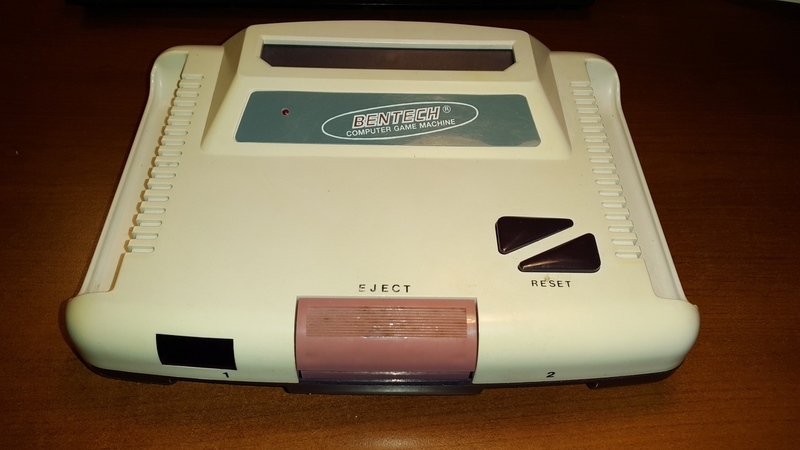 This model of famiclone console(SY-200) were designed in 1989,which was popular in China and been exported to Brazil and some European countries. 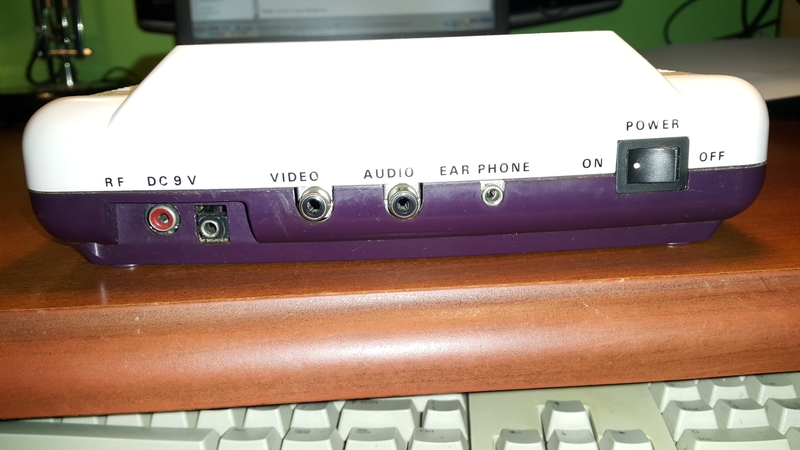 Two remote controller can not control 1P and 2P in the same time , the console can only decode one of the infrared signals. I guess this model of wireless controller chip (UA6581 UA6580) can be replaced by MCS-51. 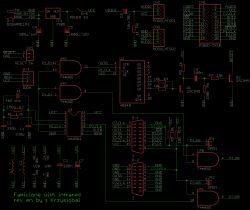 Is there a UA8580, a successor to UA6581 that offers a cleaner decoded signal and better power use? 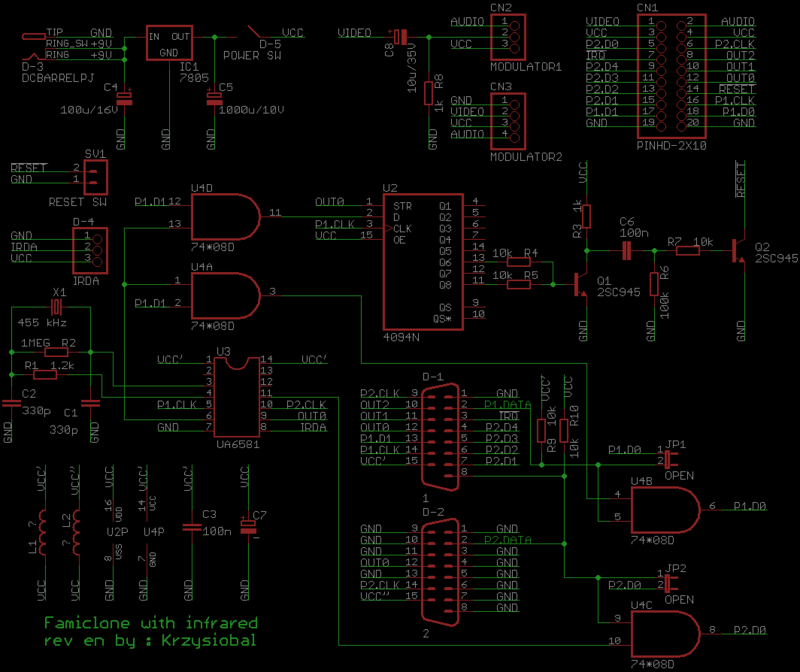 I reverse enginereed that pad, here is schematics & pinout for the chip. The turbo generator is done using additional 3 inverters.